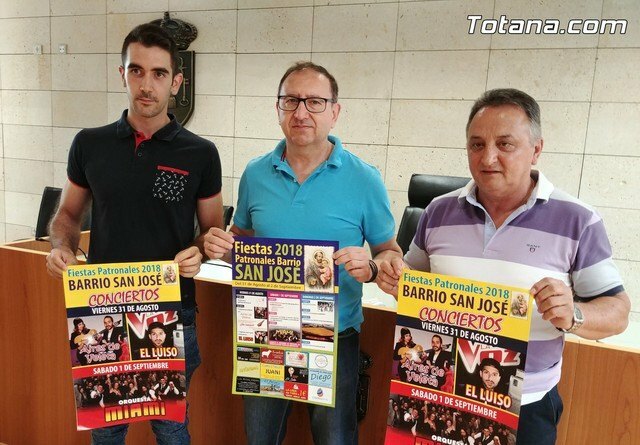 The festivities of the neighborhood of San José will be held from August 31 to September 2 and contemplate an extensive program of activities, during this weekend, aimed at all audiences and organized by its Neighborhood Association. The councilman of Celebrations, Agustín Gonzalo Martinez, accompanied by people in charge of the Neighborhood Association of the neighborhood, Juan Francisco Martínez and Antonio Martínez Belchí, secretary and treasurer of the same, have presented the list of festive activities. and from 10:30 p.m., there will be a musical performance by the group "Aires de Veleta" and, later, with José María "El Luiso", finalist participant of the television program "La Voz". During the break a ham will be raffled among all the attendees. On Saturday, September 1, at 10:00 am, various children's games will be held with monitors, such as bike races, take the chair and breakers, among others. In the afternoon, at 7:00 p.m., it will be the healthy Mass in honor of the patron, sung by the Alegría Choir, and later procession through the streets of the neighborhood. At night, at 22:00 hours, at the end of religious activities, the performance of the "Miami Orchestra" will take place. During the break a lamb will be raffled among all the attendants. and at 2:30 p.m., a great paella and beer will be organized with popular prices. The festive activities will end that day, starting at 5:30 p.m., with the family lottery in the social room, located on Calle Andalucía, number 7 of the neighborhood.